Our team will travel anywhere to help make your day run more smoothly. 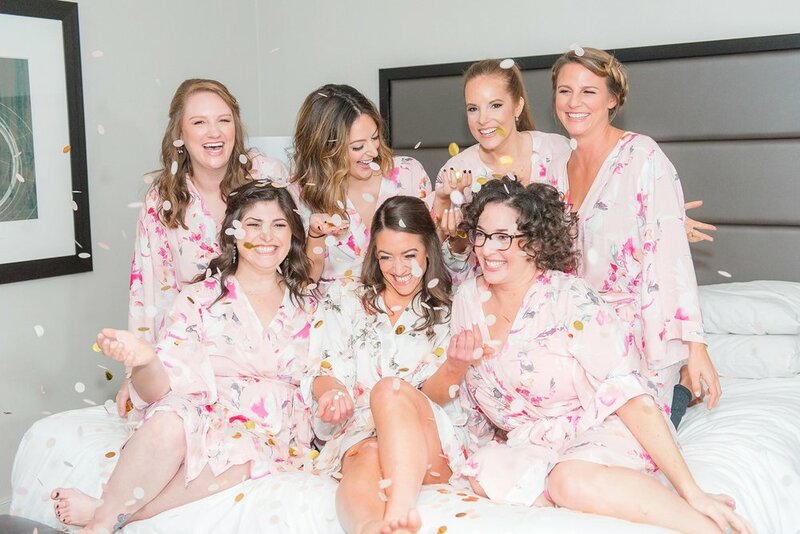 We love that we can offer our brides an on-location service or you can come in to our boutique studio. Each team member specializes in either makeup or hair. We feel that mastering one area of beauty is more effective and find that clients appreciate it. Our makeup artists only do makeup and our hairstylists only do hair. JACKIE | Our owner and makeup artist specializes in beautiful airbrush makeup which truly lasts all day. We have had girls come as early as 5am for their 7pm wedding and it is still on after the reception has ended. MACKENZIE | Our makeup artist is well-rounded in both natural and dramatic. She can bring out the beauty queen in you. She loves makeup and uses all sorts of brands to give you a diverse makeup look. LINA | Our makeup artist specializes in simple yet sophisticated makeup. She will bring out the best in you. DANIELLE | Our hairstylist has a passion for hair and loves a messy bun or braid. She loves doing something sleek and elegant as well for a classic look. THIS WAY YOU HAVE THE BEST OF BOTH WORLDS.